The closed guard, in Portuguese: guarda fechada, is regarded today as one of the foundations of guard work in jiu jitsu, often classified as the first line of defence of all the guard games in the sport. a guard is considered closed once both legs of the guard player are wrapped around his opponent’s waist and the feet are crossed (locked), holding the adversary’s hips close to those of he guard player. Like many of the jiu jitsu guards, the closed guard is not a creation of BJJ, it has been used since the early beginnings of grappling centuries ago. It was, however, a very basic position with few developments (if none) in Brazil until the late 1970’s, early 1980’s. When interviewed by BJJ Heroes, the legendary Otavio “Peixotinho” mentioned that before the 80’s a Gracie motto used to be: “an armbar is only achieved with your guard open”. The history of the closed guard ‘boom’ in jiu jitsu starts at Osvaldo Alves‘ class inside the Clube Olímpico (a clandestine casino, masked as a recreation centre in Rio de Janeiro’s Copacabana). Master Osvaldo taught a class there using the term jiu jitsu, though in reality his jiu jitsu experience was limited. He was a Judo man, but as he needed to pay a license fee to teach it, he decided to call it a jiu jitsu class instead. 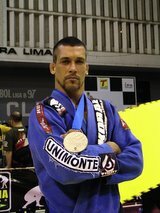 Alves was known in the Brazilian grappling community, he had lived in Japan and had a close relationship with the Gracie family, for those reasons many students from different teams regularly visited his academy, among the regulars were Otavio “Peixotinho” and Márcio dos Santos (students of Carlson Gracie) who started the exchange between basic judo and Gracie jiu jitsu closed guard techniques. Two of Osvaldo’s top students, Sergio Penha and Pascoal Magalhães Duarte brainstormed for endless hours with Peixotinho. Quickly this tight-knit association started making a dent in the jiu jitsu competitive scene. Peixotinho submitted the technical Sylvio Behring with an armbar from the guard (see video below), a technique developed by the group. Pascoal Duarte did the same with Royce Gracie and Sergio Penha became one of the toughest competitors the sport had seen in just 3 years of training, a record breaking time in the sport. The closed guard quickly became a trend, and was adopted by many of the sport’s elite, this helped shape the position into the foundation of jiu jitsu, especially taking in account its adaptability for no gi, vale tudo (MMA) and self defence, all of which were important aspects of jiu jitsu in those days. Being one of jiu jitsu’s most tested techniques due to its longevity and versatility, the closed guard started losing its predominance in sporting jiu jitsu at the turn of the millennium, with the favouritism of competitors falling on the newer styles of guards that appeared as time went by, but its still taught in most BJJ academies as the jiu jitsu foundation guard. Master Rickson Gracie commented that Master Rillion Gracie has the best closed guard in the Gracie family, i am surprised Master Rillion was not included in this list. 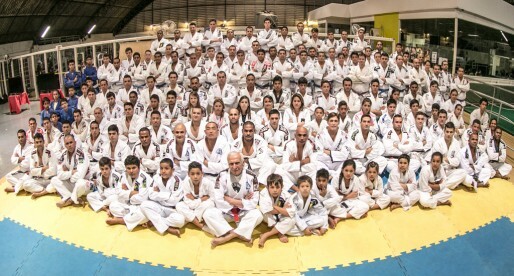 Praticamente nascido e criado em Copa, entre o posto 4 e 5, tinha um convívio diário e de amisade , com a família Gracie (Carley, Rolls, Rocian, Rayson Filinho, Robson, Rickson) e com outros lutadores de outras modalidades como Judô, pois a minha escola inicialmente foi o Judô, com Henrique Borracha, Rincao, Sansão, Boneca, Paulo Boca, Osvaldo. E foi muito interessante, pois Copa, era uma grande família e todos se misturavam com amisade, as vezes com alguma richa, mas na verdade isso foi muito bom, para a formação de lutadores de alto nível. Voltando ao Olímpico Clube, eu era muito querido no clube, o Presidente Coronel Marçal, grande amigo, me pediu para ser Diretor de Esportes, com total liberdade. Foi então que convidei Osvaldo Alves e Tarciso, grande campeão de Jiu-jitsu. Daí para frente vocês já sabem uma parte do que aconteceu. Saudações e um forte abraço em todos os amigos.